I am constantly amazed at the variety of ways people respond to stress. Joe goes for video games. I see the appeal in that—particularly because he likes the role-playing games where the story changes based on the decisions your character makes. There’s a certain amount of control, and yet a freedom in the whole escape aspect of it. I have other friends that smoke, and some that simply insist that there’s no better way to unwind than a glass of red wine or a cocktail. Still others would chime in that the best way to relieve stress is a good, hard run. I don’t see any of these responses in the light of “good” or “bad.” More and more I think that we need to be lenient with ourselves. Technology has allowed communication (and thus, work life) to speed up so much that I think people take what they can get to find some relief from the constant barrage of work communication. No, smoking isn’t really a great habit. Nor is drinking to excess. And if you played video games or exercised 24-7 that would be a problem too. But I think that every person needs an outlet. To say that choosing to do yoga over watching a movie is “better” because of its benefits to the mind and body is oversimplifying, in my opinion. There are days when I need yoga. What is it about bread in particular? I don’t know. I’ve always loved bread. As a kid, my family teased me about being the carbo-queen. At family dinners, I’d gladly opt out of dessert in favor of another slice of fresh, warm bread. When I’m stressed out, sad, or just wanting to feel better, there is nothing so soothing as making bread. The very idea of creating the food that is the very symbol of a “staple” and sharing it with others always makes me feel warm and fuzzy inside. 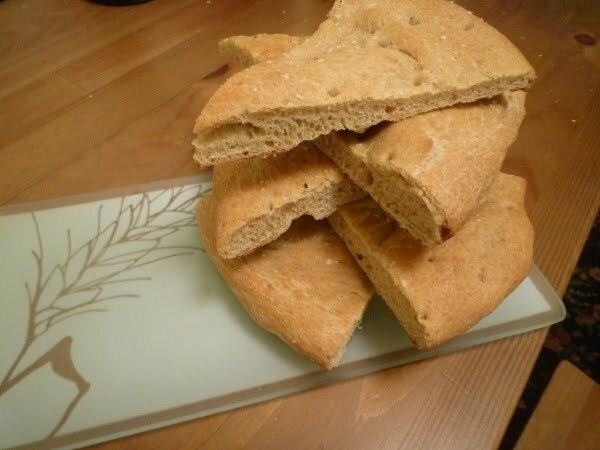 The first yeast bread I ever made was focaccia. It seemed logical to start out with something that wasn’t entirely dependent on rising or shaping…but I fell in love. A basic olive oil flatbread became heaven on a plate with a sprinkle of coarse salt or the addition of some chopped rosemary. This also makes a great pizza base. In fact, I was making a batch of this last week when Joe came home from work exhausted and prepared to order a pizza. The dough was already in the middle of rising. “No need,” I told him, “I’ll make you one.” He looked at me like I was a little bit crazy, but 25 minutes later he was eating homemade pizza. Combine water, sugar and yeast and let stand until foamy (about 5 minutes). Add the flour, oil, and salt and mix well. Turn out onto a floured surface and knead until smooth. Let the dough rise in an oiled, covered bowl until it has doubled. Punch it down, and then stretch and press it out onto an oiled sheet pan. I generally make two round loaves (about the size of a medium pizza) with this recipe. Let rise again for 15 minutes. Brush with olive oil and a bit of coarse salt or herbs and bake at 400 degrees F for 20 minutes. I can take no credit for this recipe. 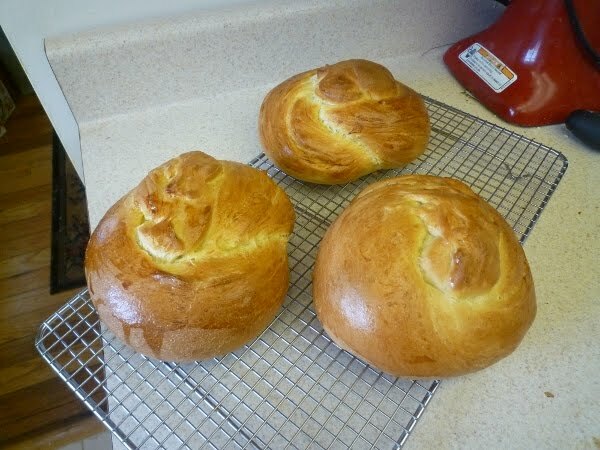 In fact, after years of stealing leftover bread knots after holidays at my parents’ house, I only recently (think: December) got around to asking my dad for the recipe. It makes 24-2.2 oz. knots, but as you can see in the picture, it works for larger shapes as well. I made three small loaves this last time around. 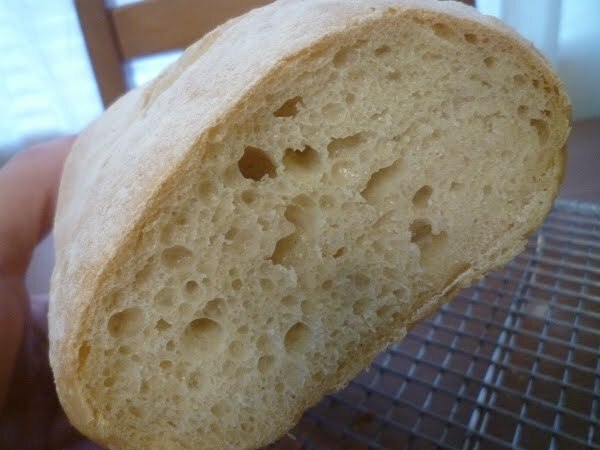 It makes a perfect sandwich bread, but I think it’s best when it’s warm or toasted. Combine water, sugar and yeast and let stand until foamy (about 5-10 minutes). Add the oil, egg, and salt and mix well. Then add the flour, one cup at a time until a cohesive dough forms. Turn out onto a floured surface and knead until smooth. Roll into a ball and place in an oiled bowl. Cover the bowl with a tea towel or plastic wrap. Let the dough rise at room temperature for an hour, then punch down and let rise again for a half hour. Alternatively, you can just let it rise in the fridge overnight. I think that works best, honestly. Shape the dough into loaves or knots and then let them rise for another 15-30 minutes. Brush lightly with an egg wash (1 egg mixed with 1 tbsp. water). Bake at 375 degrees for 15-20 minutes for small knots or about 30 minutes for larger loaves. The bread is done when it is golden brown or sounds hollow when the bottom of the loaf is tapped with a finger. This is the easiest bread I’ve ever baked, and frankly tastes like it’s straight from a bakery. The minute I pulled the first crusty loaf out of the oven I knew that this would become my “go-to” bread recipe. The ingredients and method can be found here. Note: I don’t have a stone or a pizza peel and this still comes out fantastic. After shaping the loaf, I simply put it on a piece of parchment paper and put a baking sheet in the oven while it is pre-heating. When the bread is ready to go in the oven, I just take it on the parchment and set it on the pre-heated baking sheet. It’s not exactly the same, but it does produce a slightly crispier crust. 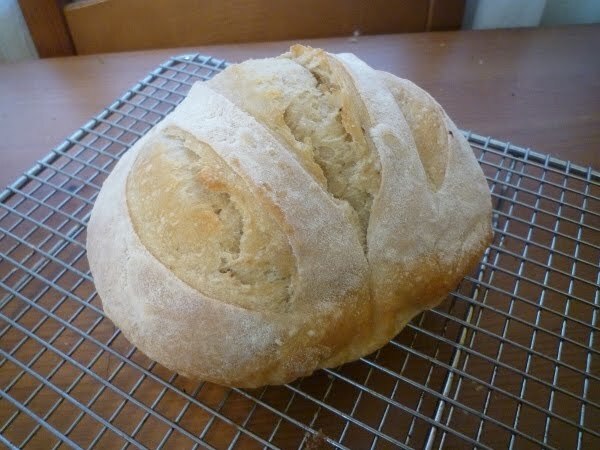 If you’re someone who has always wanted to bake bread, but feels intimidated, it’s a great recipe to try. I find that the loaves are more flavorful after the dough has been sitting in the fridge for a few days, so don’t worry about using it all at once. For a few minutes of your time before or after work, you can have fresh-baked bread that is worlds better than anything you can find at the grocery store. Trust me. Bread-baking is the gift that keeps on giving. So bake some bread, and pass it on. You’ll be glad you did.